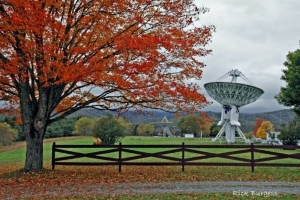 The National Radio Astronomy Observatory is a federally funded research and development center for the National Science Foundation operated under cooperative agreement by Associated Universities for the purpose of radio astronomy. The observatory is headquartered on the campus of the University of Virginia at Charlottesville, though its principal facility is at Green Bank, West Virginia, in the Allegheny Mountains. This location among high mountains in rural Pocahontas County was chosen to block radio interference from metropolitan areas. The observatory is in the 13,000-square-mile National Radio Quiet Zone, which was established by the Federal Communications Commission in 1958 to protect sensitive instruments from radio interference at Green Bank and at Sugar Grove, West Virginia, a monitoring site operated by the National Security Administration. Until 2016, the observatory operated the world’s largest fully steerable radio telescope, the Robert C. Byrd Green Bank Telescope. The observatory operates several other telescopes, among them a 140-foot telescope that employs a rare equatorial mount, three 85-foot telescopes that compromise the Green Bank Interferometer, and a 40-foot telescope used by school groups and organizations for small-scale research. The facility also operates a fixed radio ‘horn’ built to observe a radio source in Cassiopeia A and a reproduction of the original antenna built by scientist Karl Jansky to detect interference of previously unknown natural radio waves emitted by the universe. The observatory elsewhere operates the 27-dish Very Large Array Interferometer at Socorro, New Mexico, which was the setting for the 1997 movie Contact and is also the control center for the Very Long Baseline Array which includes 10 telescopes located in Hawaii, the U.S. Virgin Islands, and eight other sites across the continental U.S. It formerly operated the 12-Meter Telescope on Kitt Peak near Tuscon, Arizona, until funding was rerouted to the Atacama Large Millimeter Array (ALMA) at Santiago, Chile. The Green Bank observatory is also a popular tourist attraction and is featured in the Fallout 76 video game.